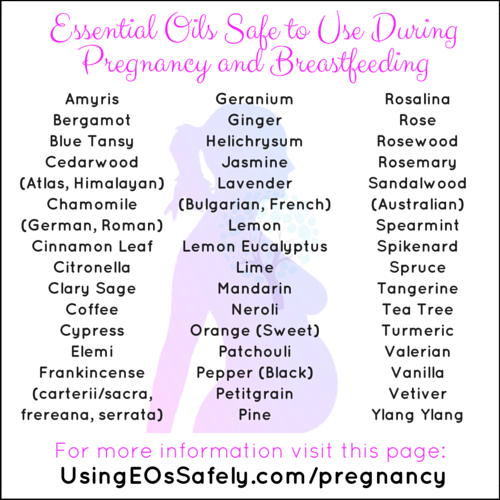 A frequently asked question we get in our safety group is about using essential oils during pregnancy and breastfeeding. This post will give you the information you need to know so that you can safely use essential oils during these special times. Before we go over the lists of essential oils to avoid, and why, let's take a peek into why there is caution needed. When a woman is pregnant, the first trimester is considered the most delicate stage. Midwives and doctors may caution us about the foods we consume, the cleaning products we use, and the skin care products we apply to our skin. Aromatherapists are also concerned with these first several weeks, when toxicity can manifest as structural defects. It is wise to use caution throughout the entire pregnancy, as functional defects can evolve even during later stages of development. When it comes to crossing the placenta, we know that in varying amounts prescription drugs, nicotine, and heavy metals have been detected in the fetal environment. Essential oils are just the right molecular size to make this journey as well. We use caution when using essential oils around babies out of the womb, and just as much caution needs to be considered while the baby is still inside a mother's body, doing its job of growing. Everything a woman consumes can get into her breastmilk – at least to some degree. We know that even the foods we consume can affect the flavor of breastmilk. Moms to gassy or colicky babies may be asked to adjust their diet so their baby can better metabolize the breastmilk. 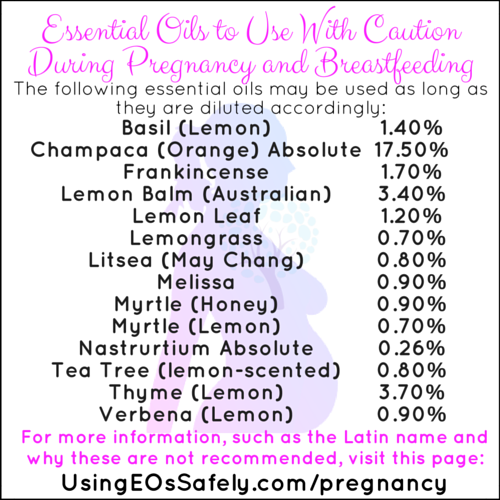 The amounts may vary, but it is presumed that less than 1% of essential oils get into breastmilk. Unless ingesting, the general, safe use of essential oils while breastfeeding should not present an issue for your baby. 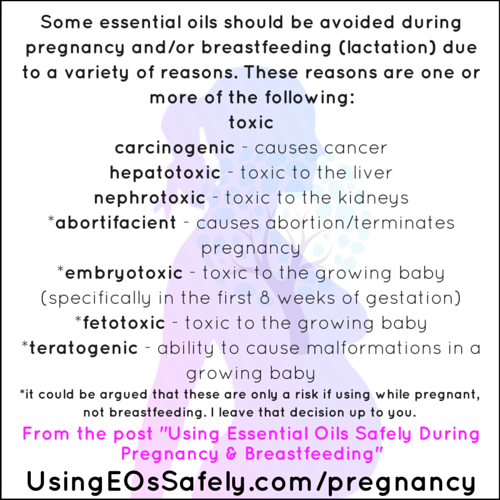 There are some essential oils which should not be used by anyone – pregnant, breastfeeding or not. You can find that list here: Essential Oils to Avoid Using Internally and Externally. 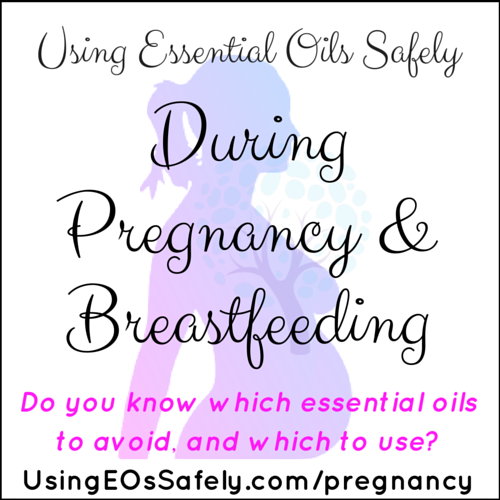 What is the harm of using essential oils if pregnant or breastfeeding? *it could be argued that these are only a risk if using while pregnant, not breastfeeding. I leave that decision up to you. The following essential oils should not be used internally, topically, or inhaled. These are the essential oils which can be used if diluted as shown below. Using more than the max dilution can risk teratogenicity (deformities in a growing baby). Definitely do not use these essential oils internally. Inhaling/diffusing is OK. There are no ongoing studies which use pregnant or breastfeeding women to test which products are safe for use during pregnancy. That wouldn't be ethical. However, there have been cases of accidental over-dose and misuse. These results, coupled with data received from animals studies, can give us a good idea if a product is harmful for human use. It is expected that if an essential oil or constituent cause harm during animal studies, that the essential oil has a strong potential for causing harm to a human baby, too. You can find lots of research on PubMed.com and in Essential Oil Safety. There are others that are OK to use as well. If you are not sure, do your research. 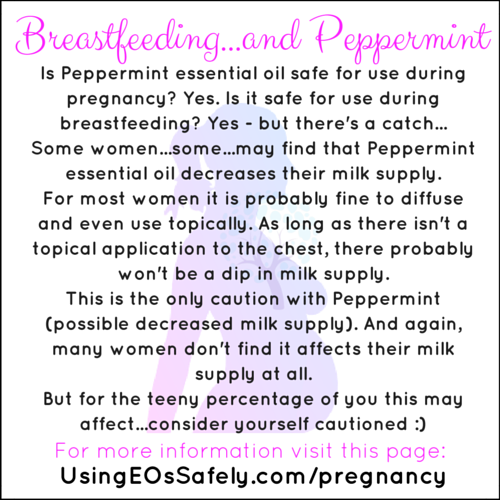 Some women…some…may find that Peppermint essential oil decreases their milk supply. For most women it is probably fine to diffuse and even use topically. As long as there isn't a topical application to the chest, there probably won't be a dip in milk supply. This is the only caution with Peppermint (possible decreased milk supply). And again, many women don't find it affects their milk supply at all. 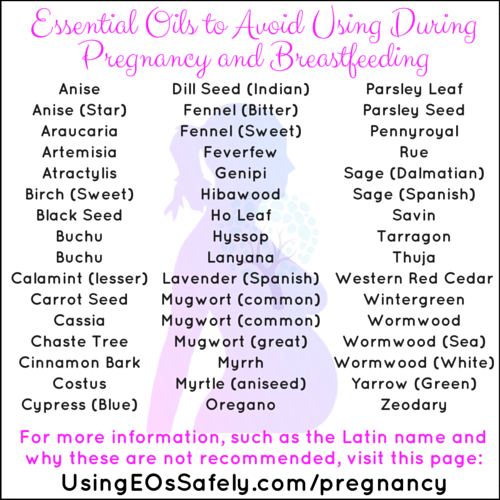 Essential Oils and Breastfeeding: Stop, Look and Listen to be Safe! What Can I Do About Morning Sickness? Can I Use Essentials Oils Safely During Labor? Increasing Milk Supply without Using Essential Oils? How Can I Use Oils Safely around my Baby? Is evening primrose oil in a hand lotion safe during pregnancy? A friend’s recipe contains 6 capsules in a half-cup shea butter (plus other EOs on the safe list).